In the materials for John Williams’ Labor Day concerts at the Hollywood Bowl, there is mention made of a successful concert containing three essential elements: A great venue, top musicians, and notable music. Anyone who witnessed Mr. Williams’ appearance would have been hard-pressed to say that any such elements were lacking from the show. As a venue, the Hollywood Bowl provided a fantastic ambiance. Located within a natural ‘bowl’ in the Hollywood hills, it was much larger than I’d expected. Apparently it seats eighteen thousand and seating on this night was definitely limited. Adding to the spirit of the scene was the concert’s scheduled 8:30pm start, just after sunset. By that time, stars were visible up in the sky and a series of strobe-lights crisscrossed overhead. I was not familiar with the Los Angeles Philharmonic until the concert. A bit of research showed it to be a well-regarded ensemble with a long history as the premiere orchestral group in the Los Angeles area. With a couple of guest favorites of John Williams performing solos, we appeared to be in good hands. 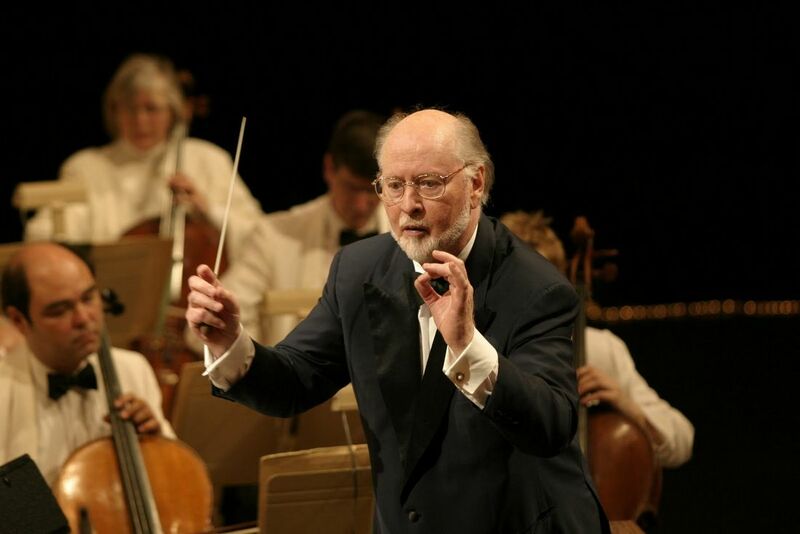 As for the music itself, John Williams presently holds the title of ‘most Oscar nominations’ amongst any living person with a total of forty-five. He’s won five Oscars and has consistently produced some of the most notable movie music over the past thirty years. Music quality wasn’t going to be a problem. Thus, it was of little surprise that the crowd went nuts when John Williams took the stage. Our standing ovation led right into him conducting the “Star Spangled Banner.” Perhaps I shouldn’t have been surprised that at a concert of this type, the packed crowd of thousands would loudly and impressively sing our national anthem. It was rather moving given the circumstances. After teasing us with the 20th Century Fox preamble music – which I suspected would be logically followed by the “Star Wars” theme, the first third of the concert was instead a tribute to ‘Golden Age’ composers such as Max Steiner and Bernard Herrmann. These first few songs were interesting, but it felt a bit like John Williams was making us have our vegetables from his heroes before giving us what we all really came to hear. Since Herrmann was a longtime music-provider to Alfred Hitchcock, the ‘Golden Age’ songs ended with a montage of his work played in time with a series of classic Hitchcock movie clips. The final quarter of the main show featured a lengthy series of clips from John Williams’ collaborations with Steven Spielberg and George Lucas. The ‘biggies’ that remained appeared in this last section. When “Star Wars” hit the screen, dozens of fans lifted their glowing toy light sabers high into the air. The cheers from the crowd for that particular song and for the “Raiders March” from the Indiana Jones films were nearly as loud as the orchestra. Having completed that last marathon of songs, Williams’ left the stage. However, since the Los Angeles Philharmonic simply took their seats after he disappeared off-stage, it left little doubt that an encore was to follow. In total though, Williams would leave the stage and then return an incredible five times before the night was actually over. The number of encore pieces actually totaled seven. Although he had already covered his most-beloved themes, he still managed to please with a couple of additional “Star Wars” selections, along with a sampling of his television work, and rounding things out with “Harry Potter. And one could tell that Williams seemed to certainly be enjoying the attention. He didn’t come across at all as arrogant, unlike other modern movie composers of fame (I’m thinking of the bizarre antics of Howard Shore while attending a concert suite of his “Lord of the Rings” music). Given that Williams’ back was often to the crowd, it was a particular treat to have the jumbo-screen cameras facing out onto him from the rear of the performance shell. This allowed the audience to see his conducting up close and it added a new dimension to works that I’d heard dozens of times. It was amazing to see him so flawlessly reconstruct selection after selection. When the show finally did conclude and the lights came up, the energy remained with the giddy crowd. Truly a remarkable opportunity to see live the man who is probably our most well-known, popular modern composer. He certainly did not disappoint. The shuttle bus parking at the Hollywood Bowl is interesting. In order to park at the actual venue, you have to arrive early and pay around $15 per vehicle. On their website, they make it very difficult to understand how to park at the venue and, instead, strongly direct you to shuttle or park-and-ride buses. Free, shuttle-bused ramp parking is available nearby. I ended up doing a park-and-ride for $5 from a nearby mall and it worked out great. People attending the concert were very friendly and chatty. From the bus-ride up, I knew that I was surrounded by my kind of geeks. And people did nothing to hide their obvious excitement for what was ahead that evening. As a further slap in the face to the people parking at the venue, those folks have to actually wait for every shuttle bus or park-and-ride bus to leave the area until cars are let out of the ramp. In fact, the buses park in front of the ramp entrance/exits. The Bowl has some interesting rules for its crowds. Oddly, you can bring a cooler into the amphitheatre and alcohol is certainly allowed. A group seated next to me was in particularly good spirits, having obviously been enjoying their wine-and-cheese pre-concert party. They were friendly too, as the surfer-girl next to me offered a cheese stick. I guess it was a wine and cheese-stick party. Yes, they a bit odd here. A crowd favorite during the performance was an oddly-long shot on a section of the philharmonic featuring a clarinet player who never seemed to ever actually be playing. The shots of him not playing lingered for so long that when there were finally two brief shots of his actually blowing into his clarinet, the crowd erupted in cheers. He showed no indication of understanding that those cheers and laughs were for him.